Mandela’s funeral provided a fitting epitaph to the man himself. Like the man’s life after he was released from prison, much of it was a carefully choreographed show for the gullible. While for the trans-national corporations Mandela’s release offered the opportunity to replace the hostile white nationalist regime with one more amenable to their aims. In effect, it amounted to regime change brought about through the trans-national corporations like Anglo-American corporation, assisted by their PR men and the media. For the cynical it was little more than a bad joke at best, which is what Mandela’s tribute service amounted too. First the service was delayed by nearly an hour, after a torrential downpour drenched the proceedings and left mourners soaked. It was almost the gods had decided to rain on Mandela’s final parade. Certainly some superstitious white Boer nationalists might see it that way. 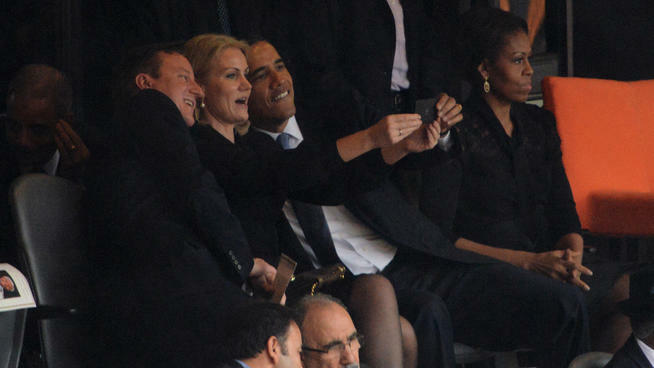 Then British Prime Minister David Cameron and President Obama were caught taking a ‘selfie’ of themselves. Much to their obvious amusement, which was distinctly at odds with the intended tone of the service. Among the mourners paying tribute were a throng of famous fakes and frauds: Bono, former presidents George Bush, Bill Clinton and former U.S. Secretary of State Hilary Clinton. Also there was Zimbabwe’s President Robert Mugabe, who was cheered by the assembled crowds and South Africa’s President Jacob Zuma, who was booed. Now the translator who was supposed to render speeches at the memorial service into sign language has been exposed as a fraud. Like they say: you couldn’t make this up. The translation of speeches into sign language at Nelson Mandela’s memorial service was seen as a sign of inclusiveness, but it appears the sign language interpreter was a fake, according to several expert organisations. Braam Jordaan, a deaf South African and board member of the World Deaf Federation, said the interpreter was making up signs as he went along. “The structure of his hand, facial expressions and the body movements did not follow what the speaker was saying,” Jordaan said. The man who signed for a section of the ceremony, including Barack Obama’s speech, was simply making up his own signs, he said. 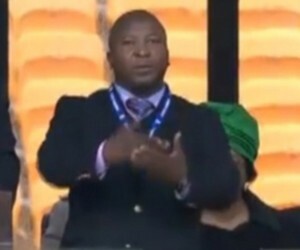 Members of South Africa‘s deaf community have previously raised concerns about the interpreter, who has been used at other African National Congress events. 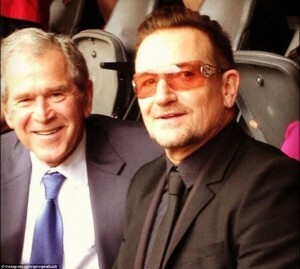 Despite this an ANC spokesman said on Wednesday: “I don’t know this guy. He doesn’t work for the ANC. It was a government event.” A spokesman for President Jacob Zuma said he was checking the reports to try to determine the man’s identity. South African sign language interpreter Francois Deysel added on Twitter that the interpreter was “making a mockery of our profession”. Sheena Walters, of the World Association of Sign Language Interpreters, noted that the sign language the interpreter was using was unconventional at best and not recognisable as any accepted form of international or South African sign language. “It seems quite obvious that the interpreter isn’t using South African sign language,” she told SBS. Deaf news blog The Limping Chicken agreed and criticised the interpreter’s methods of communication. He signed with a “strange repetitive rhythm to his movements” and “the structure of his hand and body movements didn’t seem to change no matter what the speaker was saying”, they wrote.